Beth Ann & Jessica's Helpful Savings: Bath and Body Works: Buy 3 Get 3 Free on Signature Body Collection, Free Shipping $25+ Orders, 2% Cash Back! 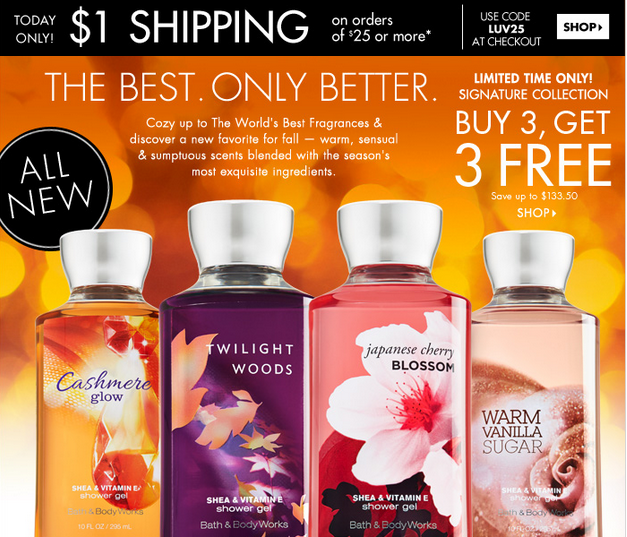 Bath and Body Works: Buy 3 Get 3 Free on Signature Body Collection, Free Shipping $25+ Orders, 2% Cash Back! For a limited time only, buy 3 get 3 free on Bath and Body Works Signature Body Collection! Also, today only, get $1 shipping on $25+ orders with code "LUV25".